Joel Natalino Santana (born December 25, 1948) is a Brazilian football head coach and former football player. The last team he coached was Vasco da Gama, in 2014. Born in Rio de Janeiro, Santana played his entire career as a central defender in his native Brazil in the 1970s. He became best known as a player at Vasco da Gama, but failed to earn a cap with the national team. In 1980, he retired as a player and moved on to club management with Al Wasl in the United Arab Emirates. While much of his management career has been with Brazilian clubs, Santana has also coached clubs in Saudi Arabia and Vegalta Sendai in Japan's J-League. Santana is one of the few head coaches to win Brazil's Campeonato Carioca with each of the four big clubs (Botafogo, Flamengo, Fluminense, and Vasco da Gama). His playing style has been characterized as defensive, with the main objective of preventing the opposition from scoring. 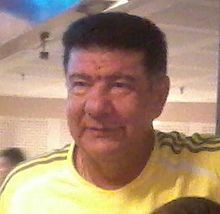 In 2004, Santana successfully kept Vasco da Gama from relegation to the second division of Campeonato Brasileiro in his fourth stint as club's head coach. A year later, he was hired by Flamengo to also save them from relegation, which he did successfully. Having established a reputation as an "escape artist" capable of rescuing teams from relegation, he returned to Flamengo in 2007 with the same goal. He not only prevented relegation, but lead the Rio state club to a surprising third place finish to qualify for the 2008 Copa Libertadores. In April 2008, Santana replaced his countryman, Carlos Alberto Parreira, as the coach of the South Africa national football team following a recommendation from Parreira himself who left the job due to personal reasons. In October 2009 Santana was dismissed from the position due to the poor results achieved by the team; most notably a streak of eight defeats in his last nine games as coach of the Bafana Bafana. Joel Santana returned for his fifth spell as Flamengo's head coach on February 3, 2012. On July 23, 2012, Santana, after two consecutives loses, against Corinthians and Cruzeiro, was fired from Flamengo. On April 8, 2013, after Jorginho's dismissal, Santana was hired for Bahia. He worked for fourth time at the Tricolor from Salvador. In 2012, after a video featuring a post-match interview given by Santana during the 2009 FIFA Confederations Cup went viral as a result of his poor English language skills, he acted in a commercial for Pepsi, saying code-switching phrases such as "Ele quer saber se your dog has a phone" ("He wants to know if your dog has a phone number" - a tongue-in-cheek Brazilian Portuguese slang expression used when picking up women) and "Me dá uma Pepsi. Pode to be?" ("Can you give me a Pepsi? Can it be?" [sic]). In 2013, he became the star of another commercial: an ad series for Head & Shoulders, again making light of his poor English. Happy with this and the former success, Santana told Brazilian sports channel SporTV about his experience in South Africa: "[Speaking English publicly] was indeed risky. The English-speaking press, very nobly, said: 'We don't care whether you are saying it right or wrong, mate, your feelings are actually what we want to know about.' And I think, in football, one needs to have feelings, otherwise, if one just philosophizes, one will never go further. Because of this, at that time, I risked myself. It turned out to be a plus, because I figured out a way to be a good pitchman." ^ a b Enciclopédia do Futebol Brasileiro Lance Volume 2. Rio de Janeiro: Aretê Editorial S/A. 2001. pp. 430–431. ISBN 85-88651-01-7. ^ Enciclopédia do Futebol Brasileiro Lance Volume 1. Rio de Janeiro: Aretê Editorial S/A. 2001. p. 99. ISBN 85-88651-01-7. ^ "SA and Santana part company". BBC Sport. October 19, 2009. Retrieved October 24, 2009. ^ "Empresário de Joel confirma que técnico tem acerto com o Flamengo". Globo Esporte (in Portuguese). February 3, 2012. Retrieved February 5, 2012. ^ "Joel Santana técnico do Flamengo". Lance! (in Portuguese). July 23, 2012. Archived from the original on July 26, 2012. Retrieved July 30, 2012. ^ "Joel Santana gasta seu inglês em campanha da Pepsi" (in Portuguese). Exame Abril. Retrieved February 26, 2014. ^ "Joel comemora o sucesso de seu inglês: 'Virei garoto-propaganda'". Sportv (in Portuguese). June 2013. Retrieved February 26, 2014.